Are you on the side of light or darkness? This is the question you will have to answer in Archangels Salvation by NetEnt. This slots game features demons and angels battling it out for the fate of the world. You have 2×2 big wilds as well as a Heaven and Hell feature in this video slot. Players can also earn as much as 25 free spins when they trigger the free spins feature. Read on to be enlightened on these bonus features. The overall graphic design of Archangels Salvation is very impressive indeed. The symbols there on the reels and background imagery as detailed and pristine. If you look to the right of the reel, you will see a frightful Demon while on the left side you will see a beautiful Angel. The symbols present on the reels comprise of angels, demons, helmets, skulls, hoods and lions. You also have crystal designed hearts, clubs, spades and diamonds as the other symbols on the reels. If you land five of either the angels or demons on an active payline you will earn 150 coins. The 2×2 wild icon will replace every symbol on the reel apart from the Scatter icon. 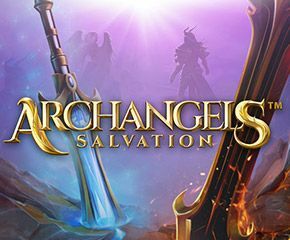 You can begin playing Archangels Salvation with as little as 40p minimum bet per spin or as much as £200 maximum bet per spin. In this game, you have two hot spot areas. The first hot spot areas comprises the two upper rows while the second hot spot area consists of the last two rows at the bottom of the reel set. A wild feature can be activated on each hotspot area where the 2×2 wild is seen partially or completely on the two upper rows (hot spot areas) the Heaven feature is activated. Where the 2×2 wild partially occupies the upper rows, you will have two stacks of wild symbols included on the reels. On the other hand, if the 2×2 wild is completely on the upper rows, then four stacks of wilds will be included on the reels. The Hell feature of Archangels Salvation is triggered when a 2×2 wild either partially of completely lands on the lower two rows of the reel set. Where the 2×2 wild is partially on the lower two rows of the reels, 8 single wilds will be included on the reels. Alternatively, where the 2×2 wild is completely on the lower rows, you will have 16 single wilds included on the reels. The free spin feature of Archangels Salvation is triggered when you land at least three scatter icons in view on the reels. With 3, 4, 5 and 6 scatter symbols on the reels you will earn 10, 15, 20 or 25 free spins respectively. However, the free spins cannot be reactivated during this round. 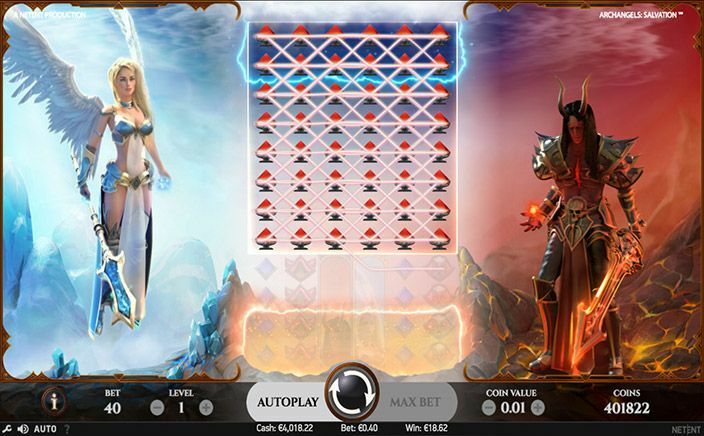 This video slot features the epic battle between good and evil. You can pick up the spoils of war in the hot spot area and free spin bonus features. This is a creative and exciting game to play with huge prize awards available for winners.